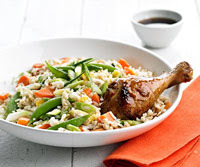 Chicken drumsticks are served with a simple vegetable and rice mixture in this quick-fix dinner. In large nonstick skillet heat 1 tablespoon cooking oil over medium-high. Add chicken, half the ginger, and soy sauce. Brown chicken on all sides. Add 1/2 cup water. Cook, covered, 15 minutes or until no pink remains in chicken. In covered microwave-safe dish place carrots, remaining ginger, and 2 tablespoons water. Cook on HIGH 4 minutes. Add rice, peas, pepper. Cook, covered, 5 minutes; stir twice. Remove chicken and juices. Wipe skillet with paper towels; return to heat. add eggs, cook and stir 30 seconds to scramble. Stir in rice mixture; heat through. Serve chicken and juices with fried rice, onions, and soy sauce. Calories 421, Total Fat 17 g, Saturated Fat 4 g, Monounsaturated Fat 5 g, Polyunsaturated Fat 4 g, Cholesterol 271 mg, Sodium 667 mg, Carbohydrate 42 g, Total Sugar 4 g, Fiber 4 g, Protein 25 g. Daily Values: Vitamin C 64%, Calcium 7%, Iron 19%. This entry was posted on 3:47 PM and is filed under Chicken . You can follow any responses to this entry through the RSS 2.0 feed. You can leave a response, or trackback from your own site.